The Arduino Pro-Mini is a great little board but you need to figure out how best you can use the features on the pins and also how you are going to program it. The Pro-Mini has neither a USB interface nor an ICSP connector. 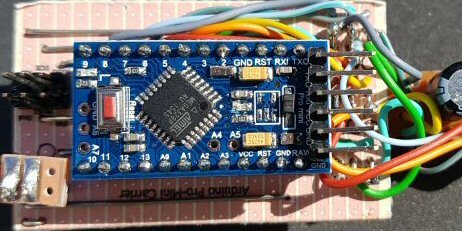 It is possible to program the board with the bootloader using a USB to serial FTDI interface. If you do this make sure that you get the correct voltage for the version of Pro-Mini that you are using. You will be using a 3.3v Pro-Mini for the Icicle project because it uses the least amount of power. 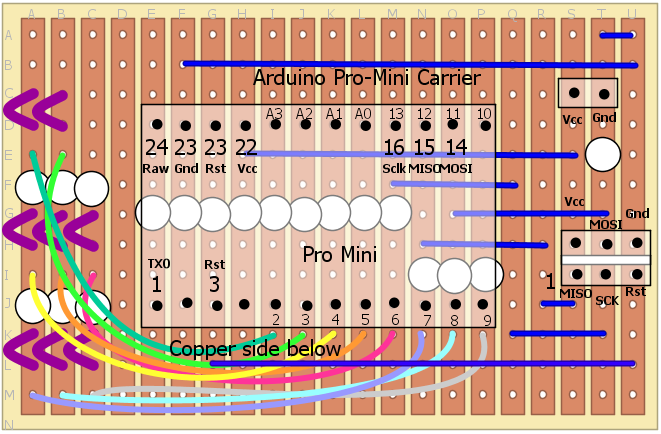 The carrier board is built from copper stripboard with the layout as shown above. Remember to cut the tracks where shown as white circles and the strip seperating the two rows of pins on the ICSP connector to the right. This is the one with MISO, MOSI and SCK signals on it.